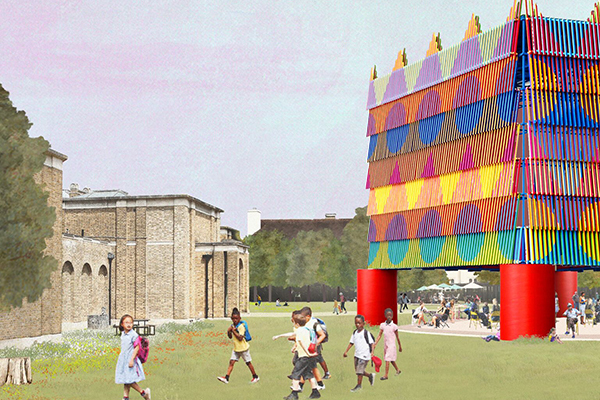 Emerging British architecture office Pricegore and British artist Yinka Ilori were announced as winners of the annual Dulwich Pavilion for their design named Color Palace. The eye-catching and colorful pavilion will come to life next summer. The pavilion will feature a Nigerian-inspired artwork by Ilori, who is influenced by the African aesthetics of his childhood. 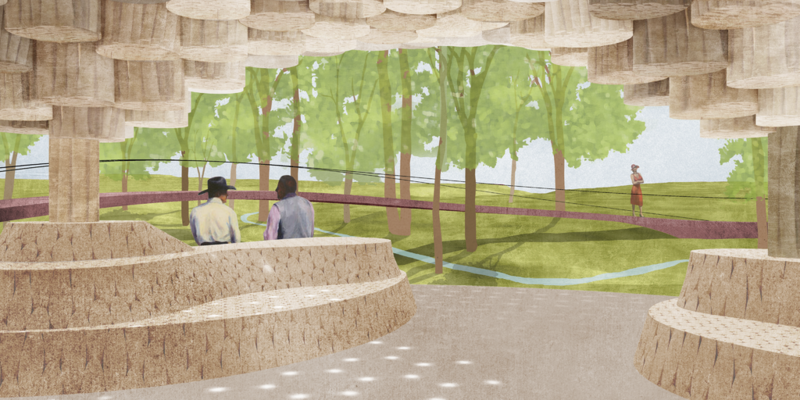 The 2019 Pavilion will house “new ticketing facilities, a pop-up catering offer and a range of events over the summer,” according to a statement from Dulwich Picture Gallery. The project is co-hosted by the London Festival of Architecture, which is an annual event that celebrates London as a global design hub. 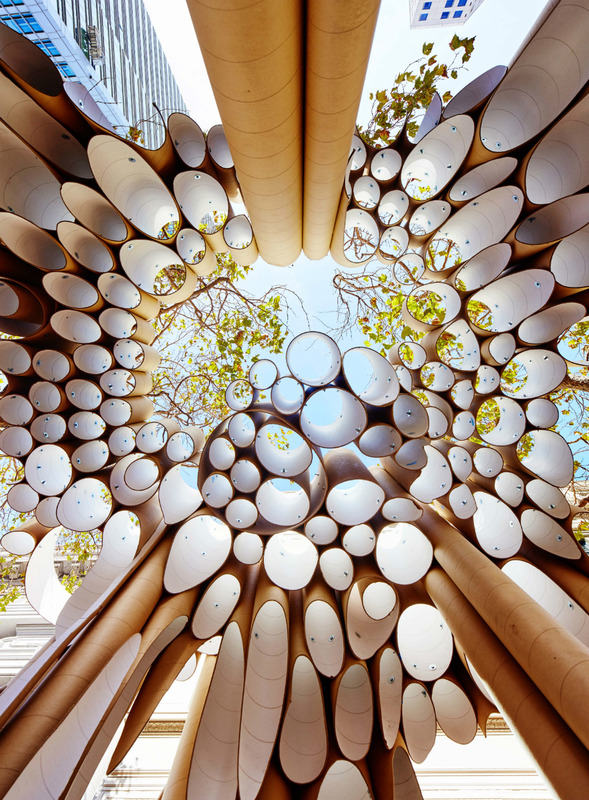 The pavilion was chosen by a jury, along with a “combined public vote,” which garnered more than 2,000 votes from visitors on-site. Pricegore and Ilori's design won over other entries from young practices including Casswell Bank Architects, e10 Studio, Flea Folly Architects, Projects Office, and PUP Architects, which won the most public votes. The pavilion's screen is composed of slats painted with circular and triangular patterns in contrasting colors supported by massive, bright red columns on the corners. The space beneath is meant for informal gathering. Dulwich Pavilion is an annual competition that will be "at the heart of the gallery's bicentenary celebrations." 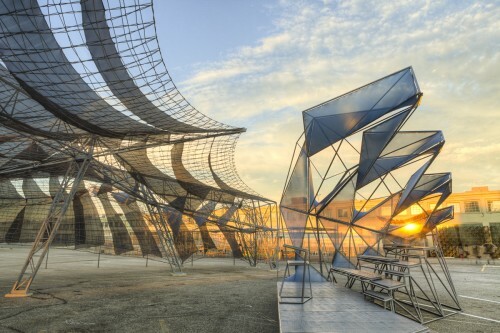 Last year, the inaugural pavilion was won by IF_DO, a 2014-founded British practice. Deborah Wye’s lecture on Orchard Beach yesterday at the City Island Historical Society Nautical Museum was months in the making. The curator emerita of MoMA's prints department was immersed in research about a year ago for the Nautical Museum's exhibit celebrating 75 years of Orchard Beach in Pelham Bay Park and in particular its bathhouse pavilion. The show, called Orchard Beach Pavilion: Past, Present and Future, runs through October 16. 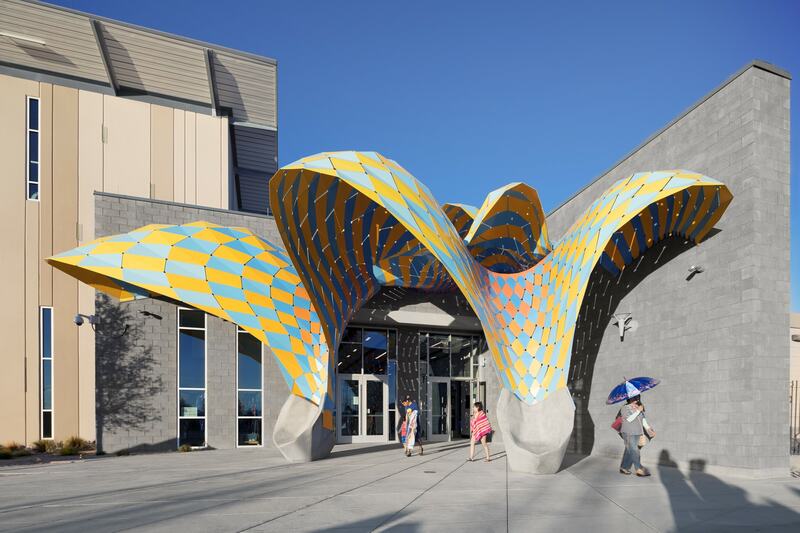 The show and lecture got a huge bump when Christopher Gray made the pavilion the focus of his "Streetscapes" column in Sunday's New York Times. Wye's efforts couldn’t have come at a better time. Orchard Beach is on an upswing. After nearly forty years of drifting off into the Long Island Sound, the beach’s snow-white sand was replaced last winter. 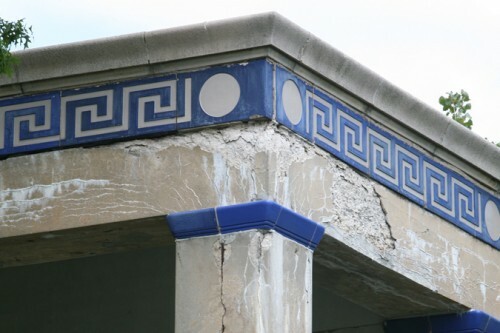 Now the crumbling bathhouse, designed by Aymar Embury II, is ready for its close-up. The building is crumbling due to a condition called calia silica reaction (a.k.a. "cement cancer"). 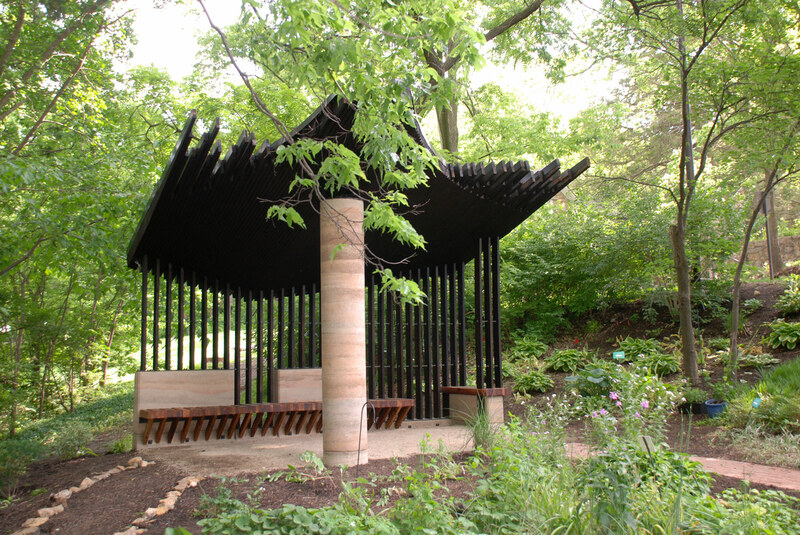 The Office of Management and Budget have sent out an RFP for pavilion proposals. 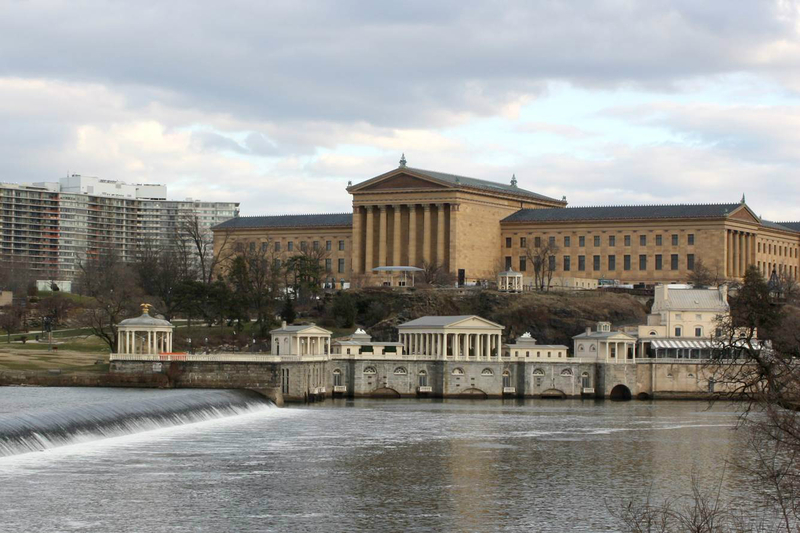 During her presentation Wye said the proposals range from tearing it down and building anew, to incorporating elements of the old structure into a new building, to an all-out restoration, which would cost more than $50 million. Orchard Beach has seen many proposals over the years that didn’t make it past the planning stage because the surrounding community beach didn’t want the increased crowds associated with theme parks, as was the case with the Seabreeze Land Development scheme of the 1980s. That plan included a 10,000-seat amphitheater and a winterized recreation facility. By the 1990s New York Water Park LLC had planned a "High Thrills Complex" that envisioned a giant water slide towering over the site. That project also got squelched. Wye said that community meetings to discuss the new proposals will take place in six to eight months. In the meantime, she plans to take her lecture on the road, presenting throughout the borough and the city in an effort to familiarize New Yorkers with this remarkable Moses-era project. As several constituencies that use the beach are not represented by the community board or the state/congressional districts, one can only hope that Wye’s succinct presentation will find its way to neighborhoods where residents who use the beach the most will get to see it. That includes parts of the South Bronx, as well as Washington Heights and Inwood sections of Manhattan. Having a Spanish translator on hand wouldn’t hurt either.